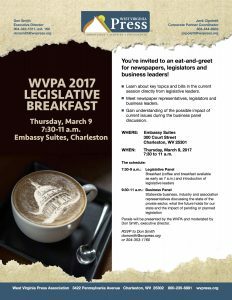 CHARLESTON, W.Va. — The West Virginia Press Association, on behalf of its 77 member newspapers, is inviting representatives of each newspaper to attend the WVPA Legislative Breakfast at the Embassy Suites, 300 Court St, Charleston, W.Va., 24301, on Thursday, March 9, 2017. “The WVPA has invited Gov. Jim Justice along with leadership and members of the House of Delegates and State Senate to gather with representatives of West Virginia’s newspaper industry. This opportunity to share insights and concerns through personal discussion is so valuable for all parties at the breakfast. Reviewing key pieces of legislation and sharing thoughts on the impact of that legislation benefits legislators, journalists, guests and our readers in all 55 counties,” said Don Smith, WVPA executive director. The WVPA notes that the presence of each newspaper and the insight from that region would add to the value of the discussion. “Please consider joining us for breakfast on Thursday, March 9. Coffee and the breakfast buffet will be available starting at 7 a.m. and the program will begin promptly at 7:30 a.m. The event should last no later than 8:55 a.m. We hope to hear from Gov. Justice and meet the leadership and committee chairs from the House and Senate,” Smith said. There will be time to discuss issues and visit with representatives – both legislative and journalistic – from around the state. The WVPA would appreciate an RSVP by telephone at 304-353-1160 or by email at donsmith@wvpress.getboho.com.